Dr. Elahé Omidyar Mir-Djalali, linguist and philanthropist, founded Roshan Cultural Heritage Institute in 2000. A generous grant of $210,000 from Roshan Cultural Heritage Institute to Stony Brook University has helped establish the Elahé Omidyar Mir-Djalali Postdoctoral Fellowship in Endangered Iranian Languages in the Stony Brook Department of Linguistics for three years. The Department of Linguistics at Stony Brook is one of the nation’s top-ranked linguistics departments with faculty specializing in Iranian Linguistics. Named for the linguist and philanthropist, Dr. Elahé Omidyar Mir-Djalali, the fellowship will promote research on the linguistic heritage of Iran, focused on endangered Iranian languages, in particular Caspian languages. 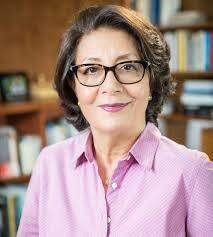 Dr. Mir-Djalali is an expert in language education, cross-cultural communication, and Persian studies. She holds a doctoral degree in linguistics with honors from the Sorbonne in Paris and was a faculty member at Georgetown University and UC Berkeley. In 2018, the Ministry of Culture in France bestowed upon Dr. Mir- Djalali the title of Chevalier de l'ordre des Arts et des Lettres−one of France's most prestigious awards−in recognition of her lifelong and significant contributions to Persian arts and culture in France and around the world. Roshan Cultural Heritage Institute was founded by Dr. Mir-Djalali in 2000 to support cultural and educational activities and nurture new educators who can preserve the transmission and instruction of Persian language and culture. The institute has awarded several million dollars in grants to establish and strengthen Persian academic programs at prestigious universities in the U.S. and around the world and has provided dissertation completion support to Ph.D. students in linguistics and Persian language and culture. The Stony Brook Linguistics Department’s doctoral program has consistently attracted top-quality graduate students, who have recently included students with expertise in Iranian languages. It is one of few top programs that have faculty expertise in Iranian languages. The Linguistics program began in 1968 and was established as a formal department in the mid-80s. A doctoral program was introduced in 1992. Stony Brook Linguistics is today one of only a few departments that offer 3 stand-alone Linguistics degrees (BA, MA, and Ph.D.) and 2 degrees in TESOL and TESOL Certification (BA and MA). Starting in Fall 2018, it also offers an MA program in Computational Linguistics. “We are extremely grateful to Roshan Cultural Heritage Institute for establishing the Elahé Omidyar Mir-Djalali Postdoctoral Fellowship in Endangered Iranian Languages. This fellowship will further the preservation and documentation of Caspian languages, an important and endangered subgroup of the languages of Iran,” said College of Arts and Science Dean Nicole Sampson. Following a national and international call for applications, the Elahé Omidyar Mir-Djalali Postdoctoral Fellowship will be awarded to a scholar holding a doctorate in Iranian languages and linguistics with expertise in one of the Caspian languages. The Elahé Omidyar Mir-Djalali Postdoctoral Fellow will be expected to conduct research in the field and teach for a three-year term.